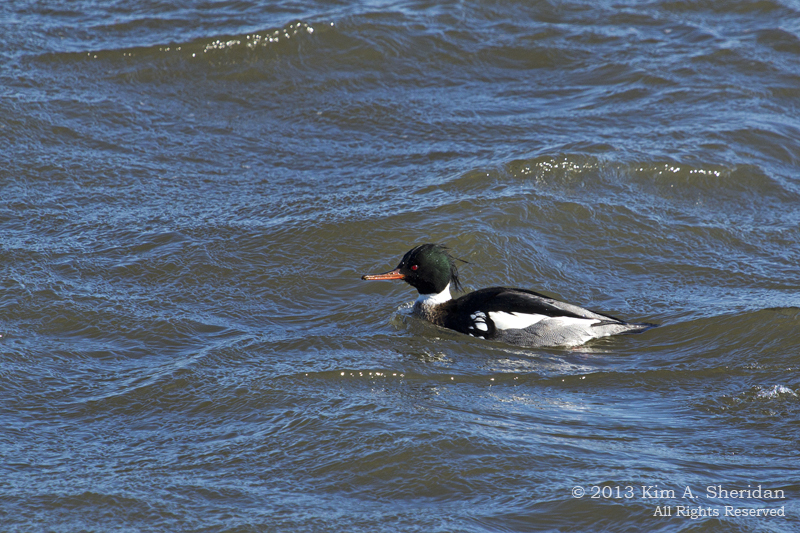 It’s become an annual tradition now, the winter pilgrimage to Barnegat Light to see the winter waterfowl. Every year it gets colder and windier, and every year the jetty gets longer. Or at least it seems longer! Especially this year, as it was my first time picking my way from rock to rock with a tripod on my shoulder. I’m not the most sure-footed of creatures, as my friends will be happy to tell you. But I also don’t have the steadiest of hands, so having the tripod was a big help. 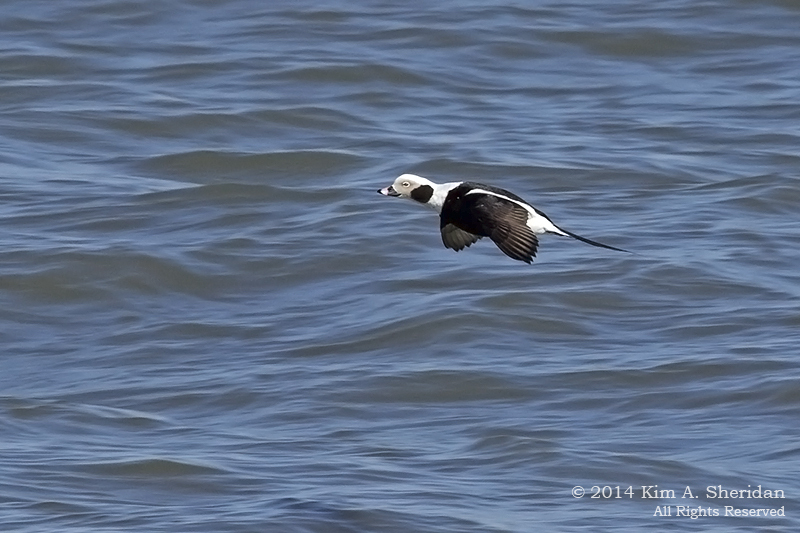 The day started with a Black Scoter near the Lighthouse. 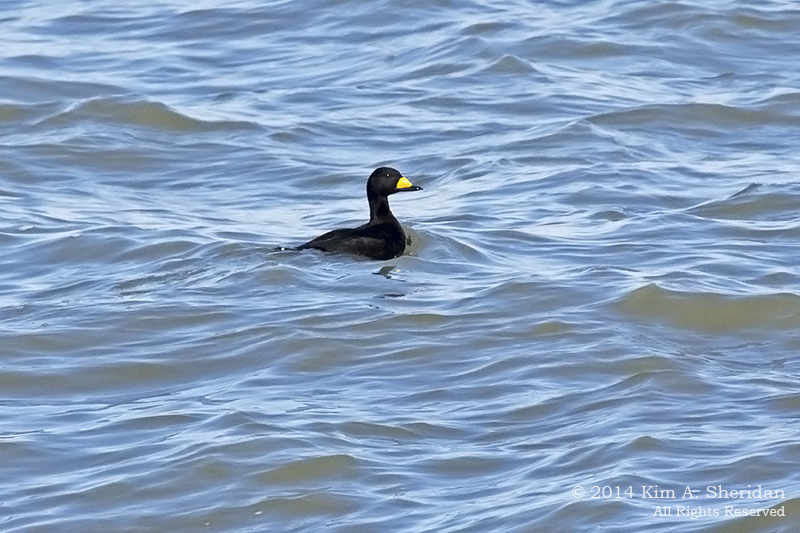 Hmmm… Dark bird on dark water. Helpful of him to have a bright yellow bill. 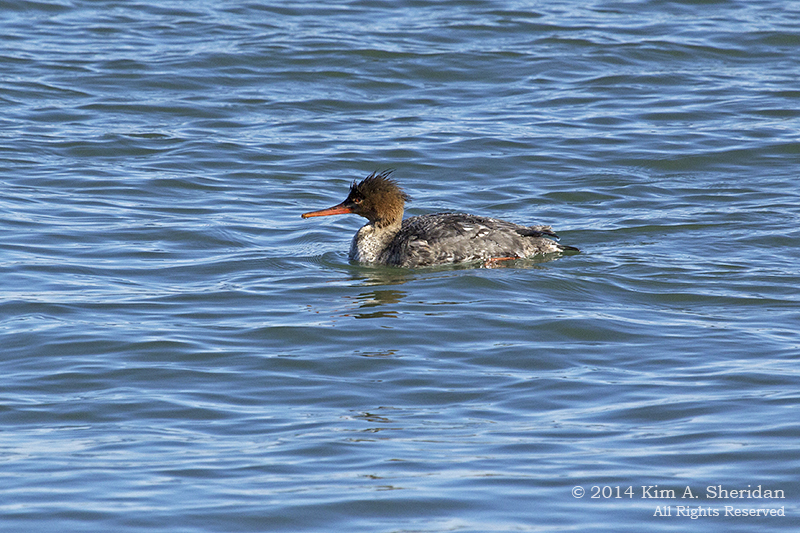 A small duck bobbed alone in the big bay. 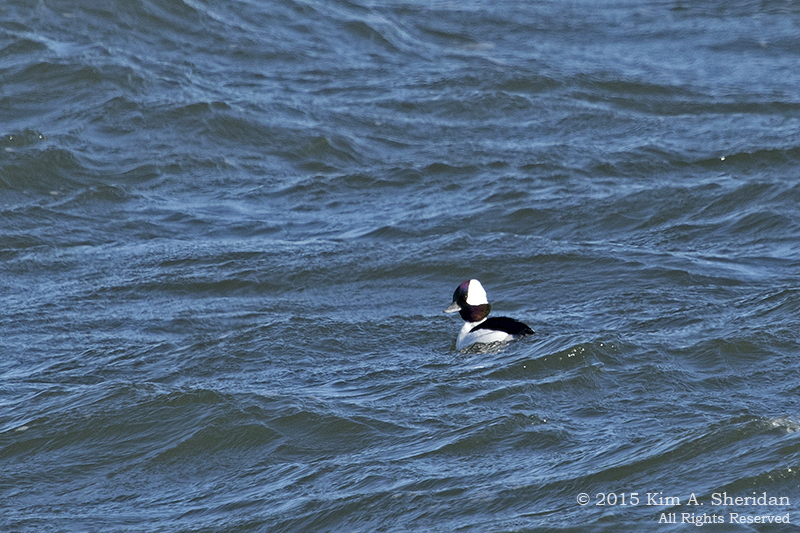 I was a little surprised to see this Bufflehead out here in the Inlet. I’m used to seeing them in fresh water lakes. But they frequent the salty bays too. 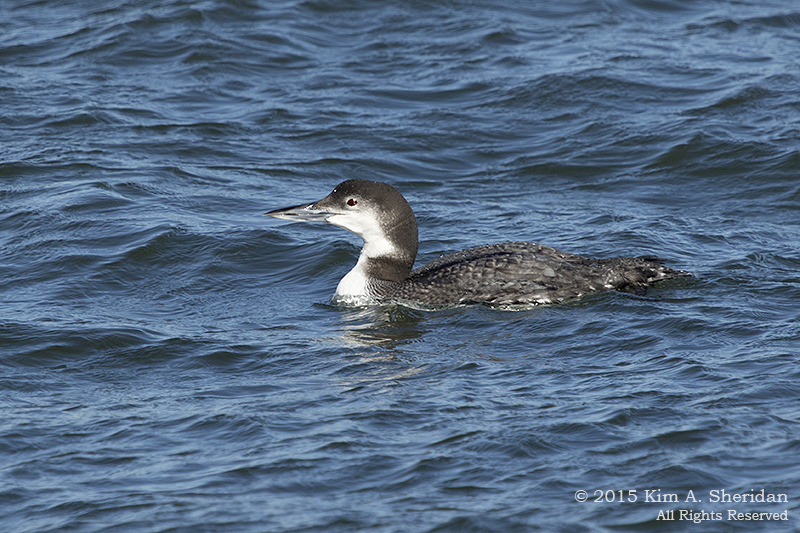 Common Loon. 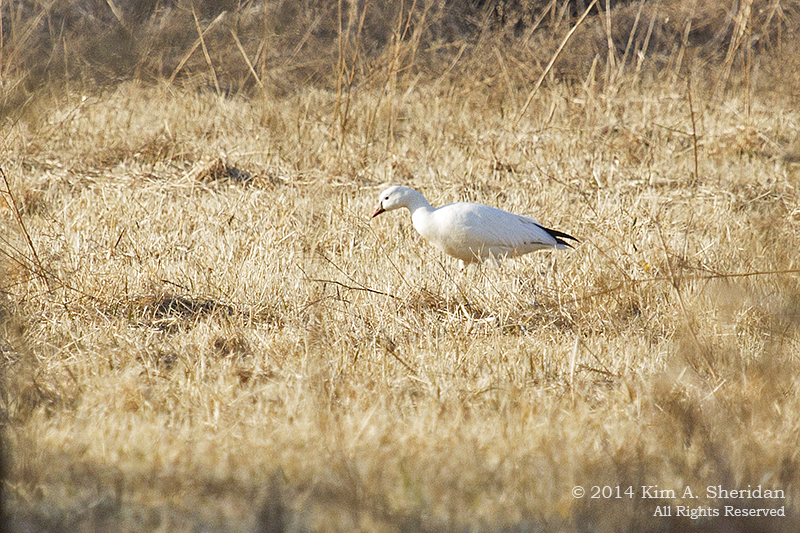 Someday I hope to see them in full breeding plumage, and hear them call. 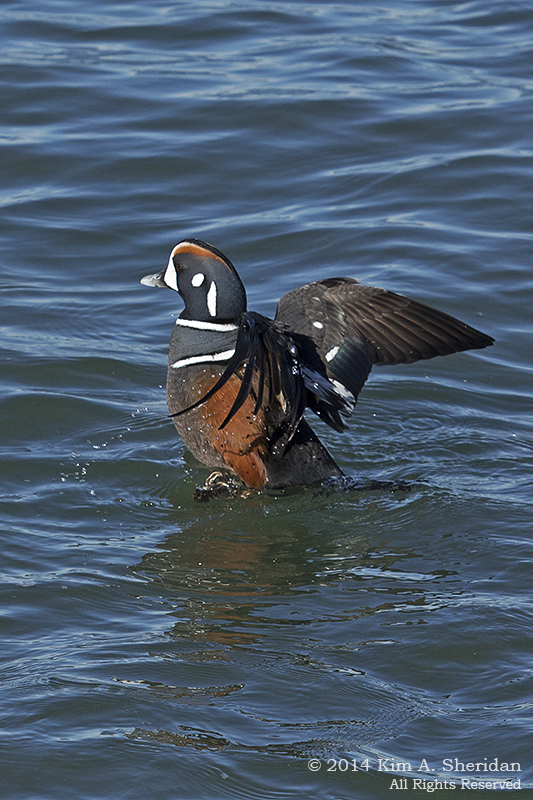 The birds we came to see are the Harlequin Ducks. Two males swam near the rocks at the end of the jetty. 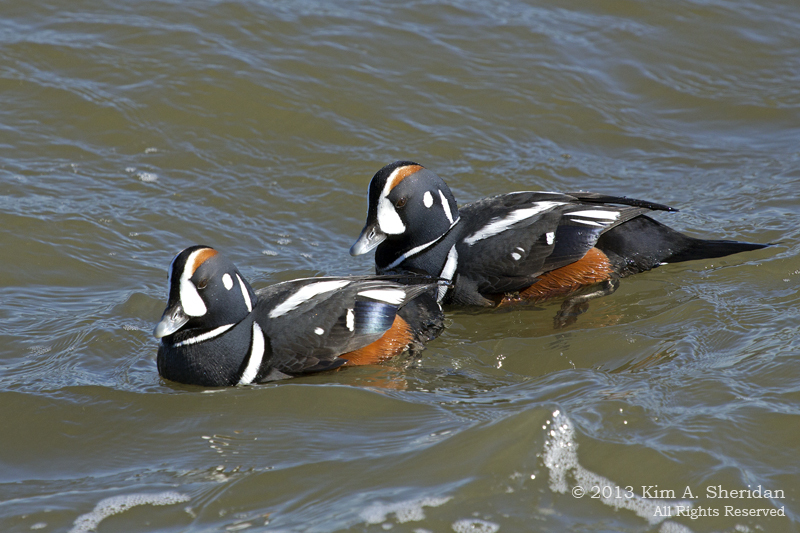 There were only four Harlequins there this day, two males and two females. We didn’t mind. Quality over quantity. It was 22° with winds gusting over 20 mph. I wore heavy wool socks, long underwear, lined pants under rain pants, a turtleneck, fleece AND insulated vest under a down jacket, a scarf, two hats and three pairs of gloves, with hand warmers inside. This duck thought I was the funniest thing he’d seen in awhile. 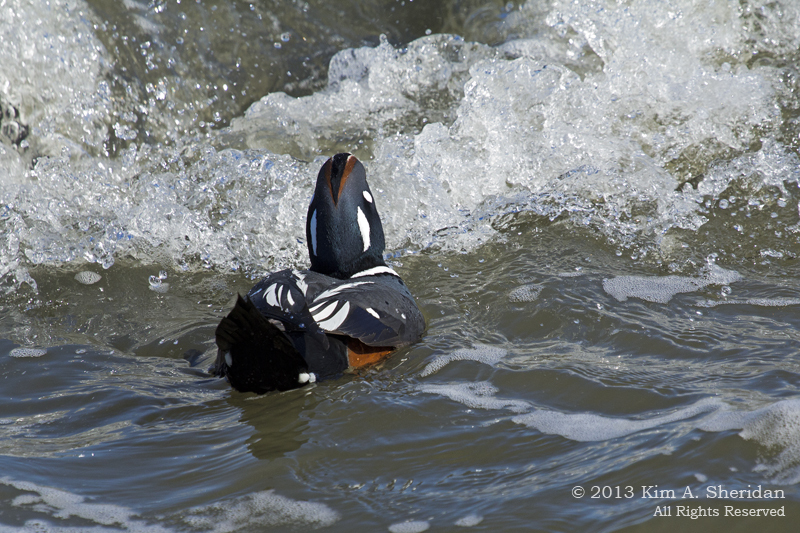 FUN FACT: Why are the ducks comfortable swimming in the frigid water while we humans are shivering on shore? It starts with their feathers. 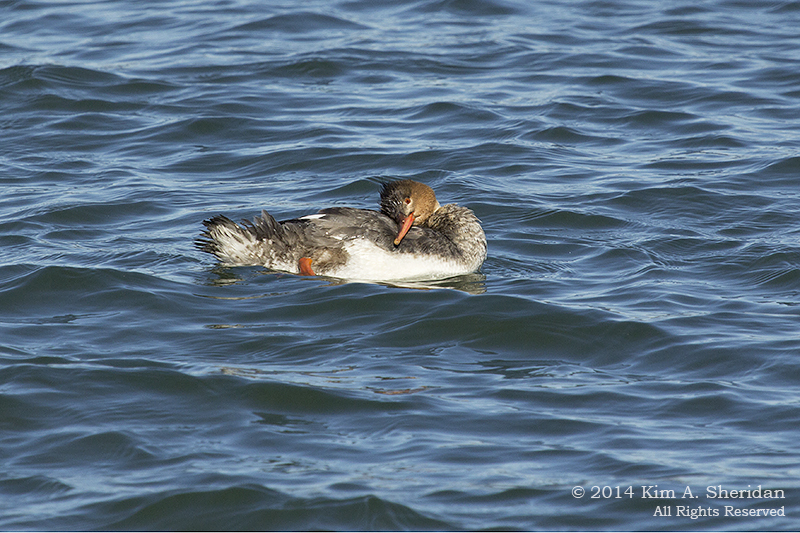 Next to the skin lies a thick insulating layer of down feathers. Above the down are layers of interlocking and overlapping feathers that leave a minimum of bare skin exposed to the elements. The birds attend meticulously to feather maintenance with liberal doses of preen oil. Look closely at a duck after it surfaces from a dive, and you will see the water beading up and running from its waterproof feathers like rain from a freshly waxed car. Ducks’ feet and legs lack feathers to protect them, and could be a dangerous source of heat loss. But water birds have evolved to combat this by utilizing a countercurrent heat exchange system. As hot blood in the arteries flows into the upper leg, it transfers heat to the cold venous blood returning from the feet. Blood that reaches the feet is much colder than the body, close to the temperature of the water in which the duck swims, but the blood that returns to the heart is warm. This heat exchange minimizes heat loss from the legs, while maintaining a healthy body core temperature. Cold feet, warm heart! Sandpipers were in attendance as well as ducks. 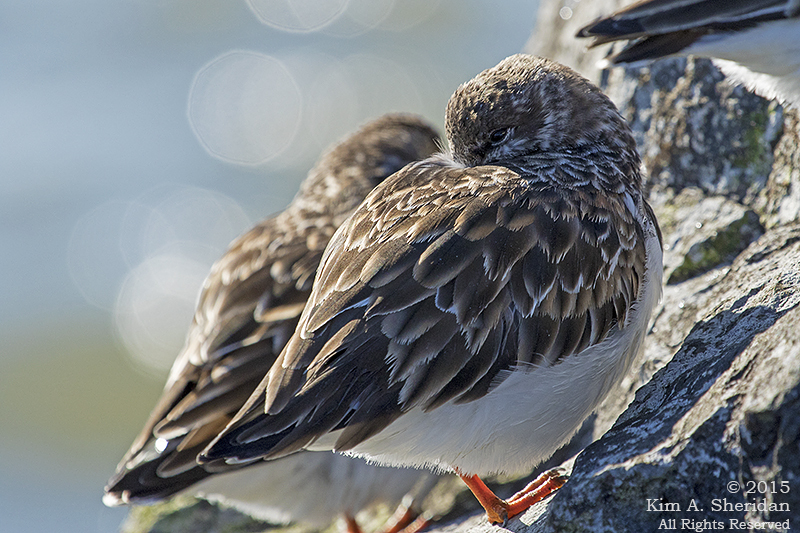 Two small gatherings of Ruddy Turnstones perched precariously on the icy rocks. 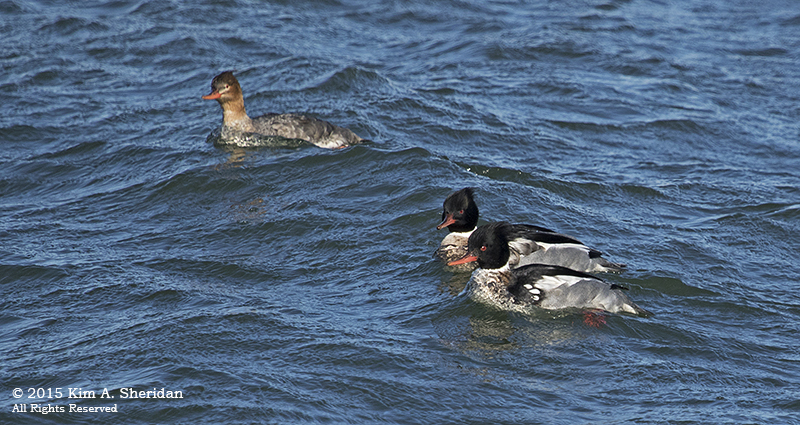 Back near the Lighthouse were three Red-breasted Mergansers, one female (rear left) and two males. 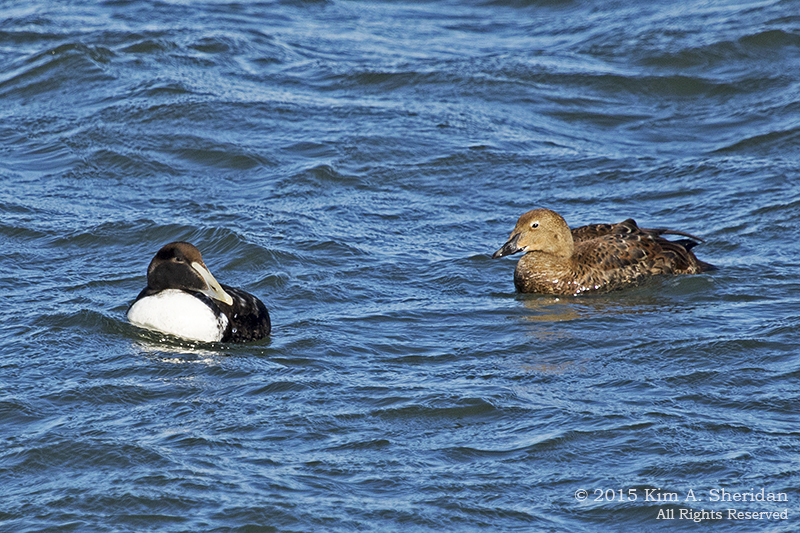 Accompanying the Mergansers were a young male Common Eider (left) and a female King Eider. 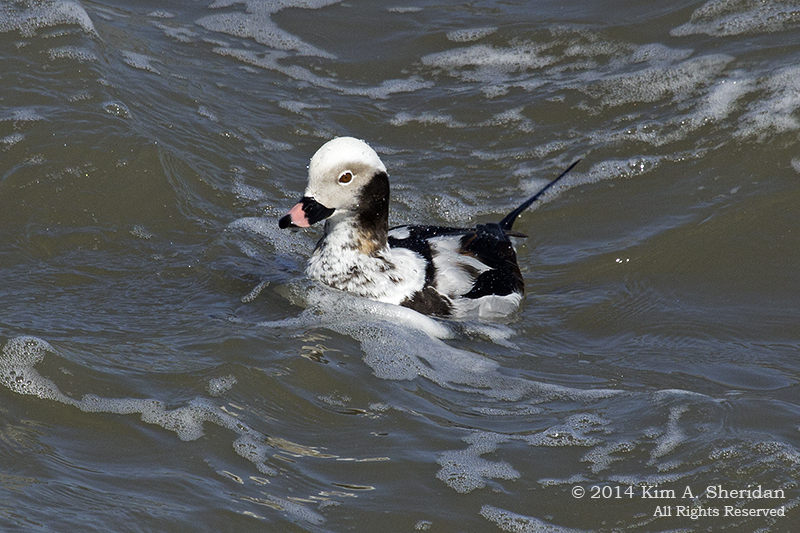 The King Eider was a new bird for me. 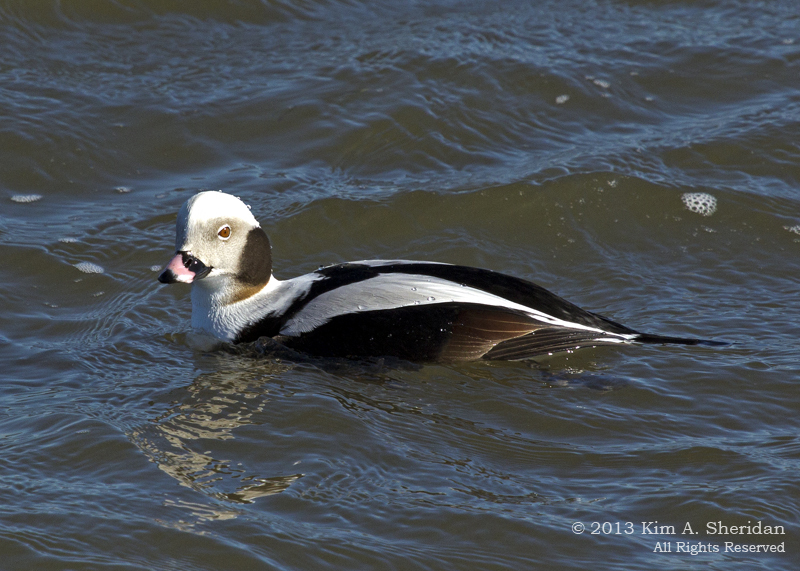 Common Eiders I’ve seen before, but only females at a distance. Seeing both this close was a treat. I’d have been happy with Eider one! 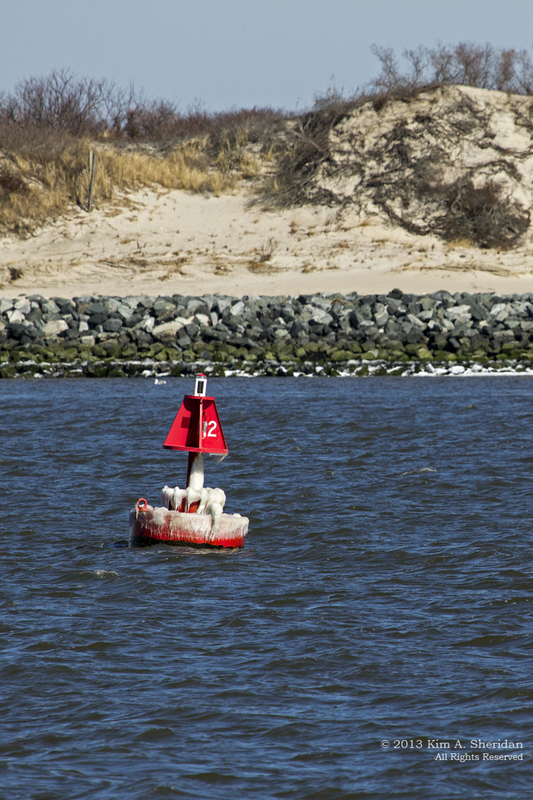 Time to snuggle in somewhere warm at the end of a cold day at Barnegat Light. It’s my fault, I admit. The snow, I mean. Two years in a row I lamented my lack of good snowy photographs to use for Christmas cards, and those years were marked by a decided lack of snowfall. Be careful what you wish for! This year Mother Nature had the last laugh. We’ve had just about 60 inches of snow, when the winter norm averages 22”. And March can still bring some big storms, so we may not be done yet. I’m done, though. I loved the snow in January and early February, but I have all the snow photos I need, thank you very much. Enough already! I’ve had it with hiking on slippery, ankle-turning ice. So the last three weekends I have escaped to the southeast, once to the Pine Barrens, twice to the Jersey Shore. No white stuff, and lots of ducks. I love ducks. They’re so colorful and varied, and they are always doing interesting things. 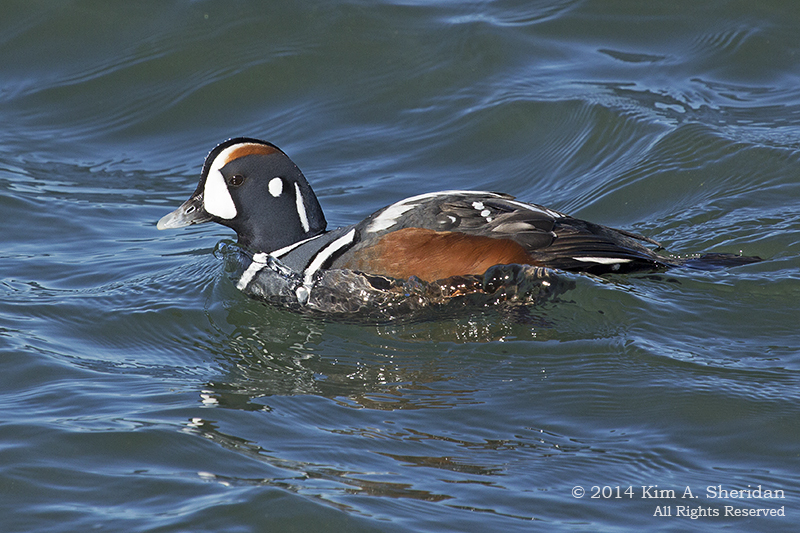 In the winter, places like Barnegat Light and Avalon draw sea and bay ducks in droves. Great places to duck out of the snow. 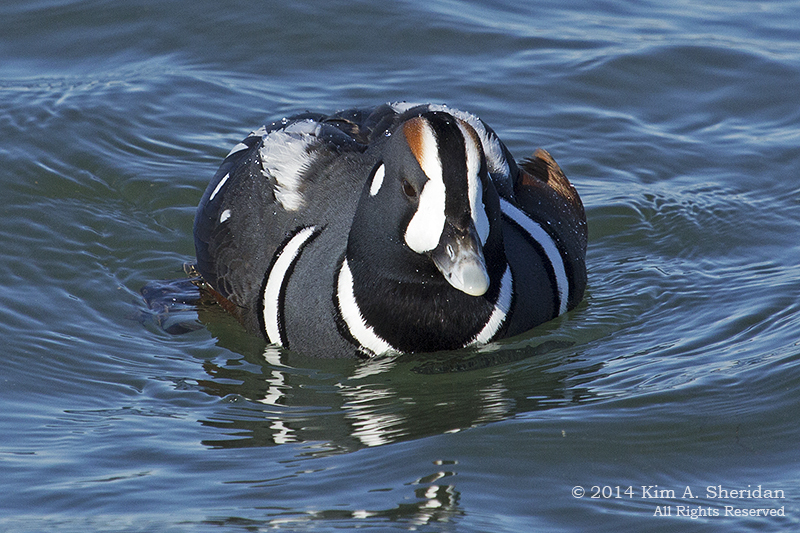 Above and below are perhaps the most gorgeous of ducks, male Harlequins. 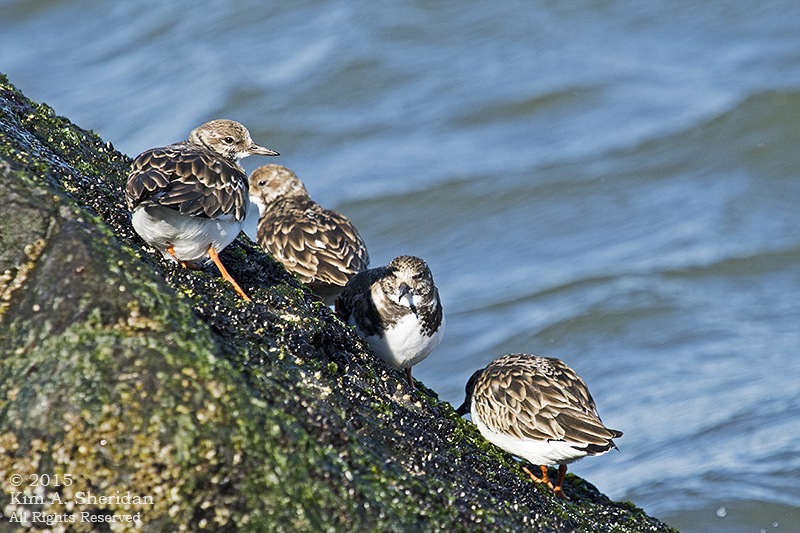 Lots of birders take the adventurous trek atop the Barnegat Light jetty just to admire these beauties. 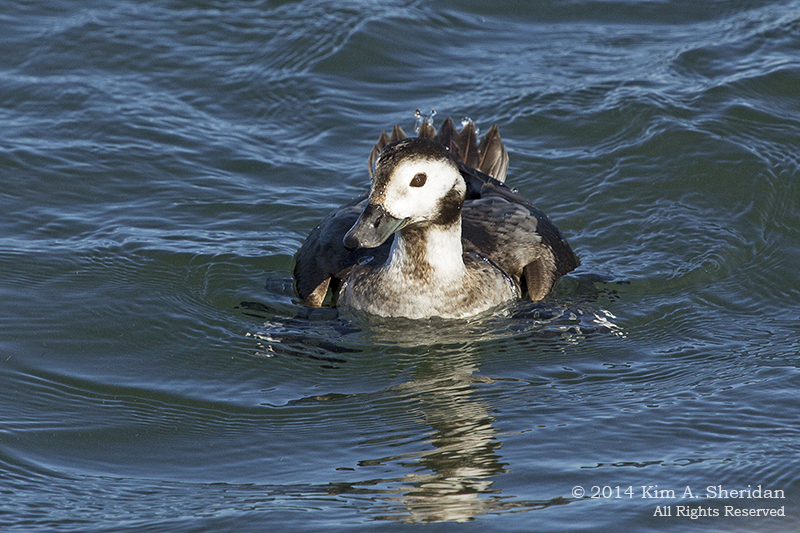 I have a soft spot for Long-tailed Ducks. They have such endearing expressions. Males are comfortable enough with their masculinity to sport pink on their bills. Females stick to earth tones. The Scoters are new birds for me this year. 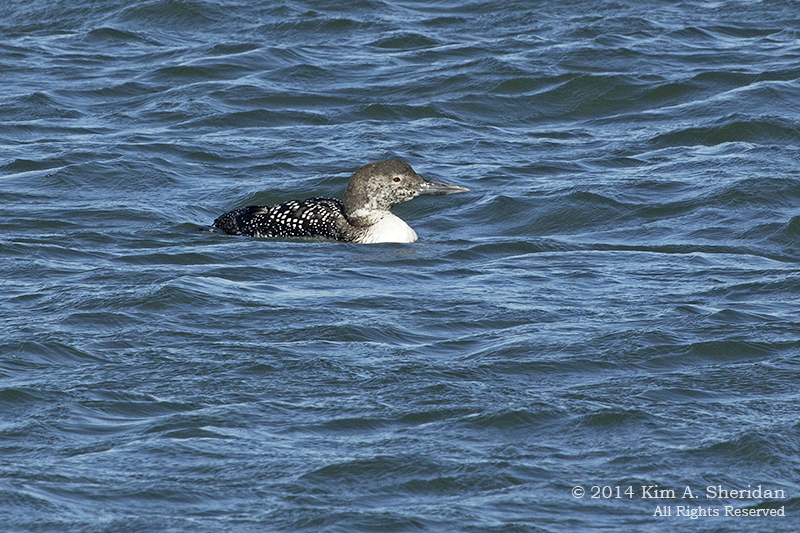 They tend to hang out farther off-shore, so they’re not as easy to photograph. 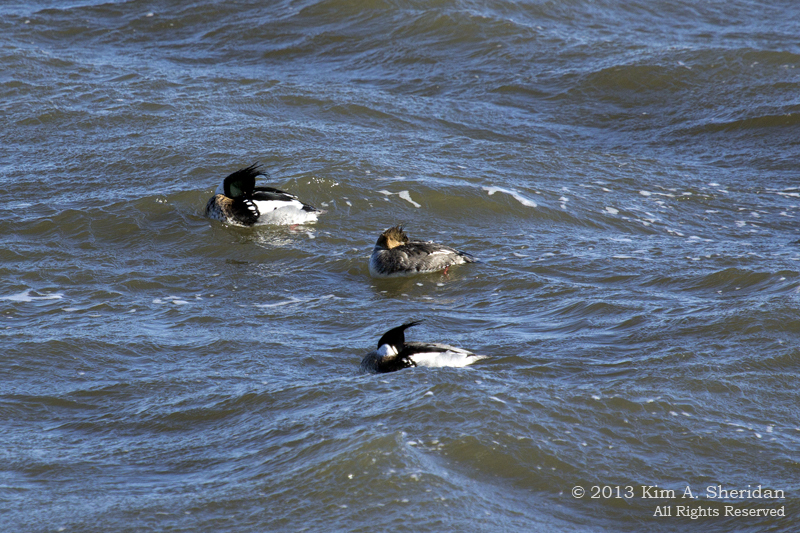 Here’s a large raft of Black Scoters in Avalon, above, with a few Long-tailed Ducks and gulls amongst them. 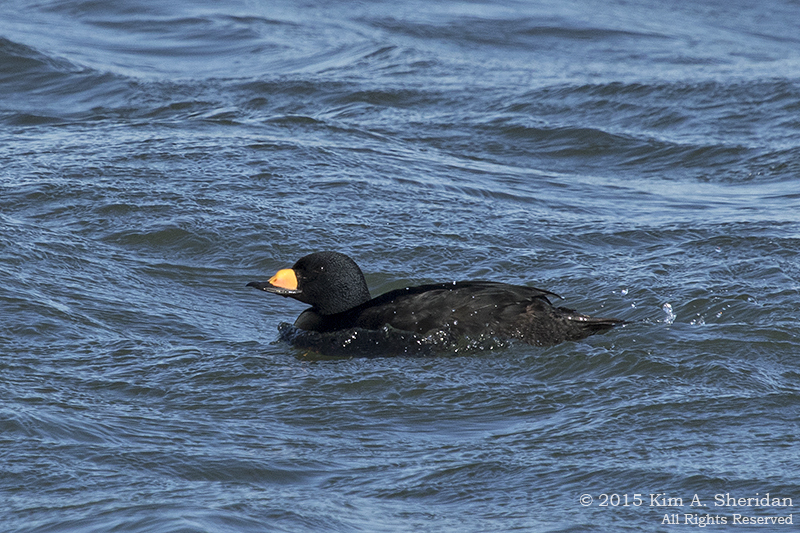 Black Scoter, male, below. 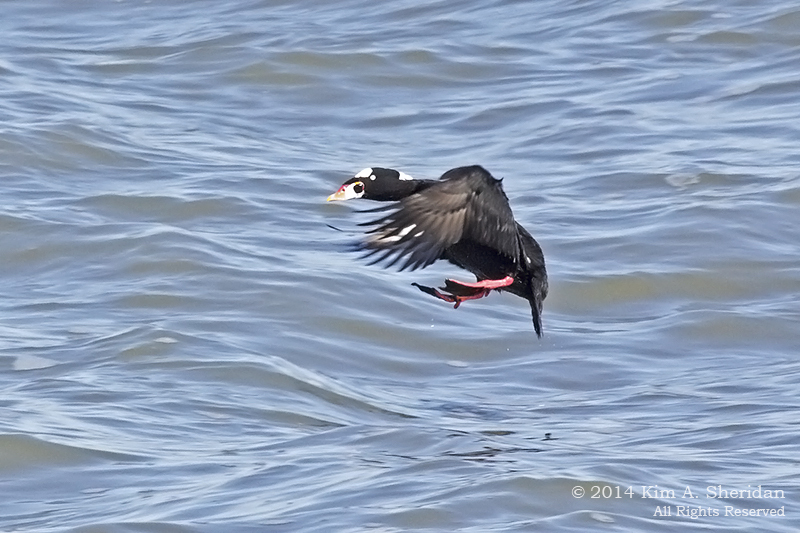 This fellow with the colorful proboscis is a male Surf Scoter. My first life bird of the day. 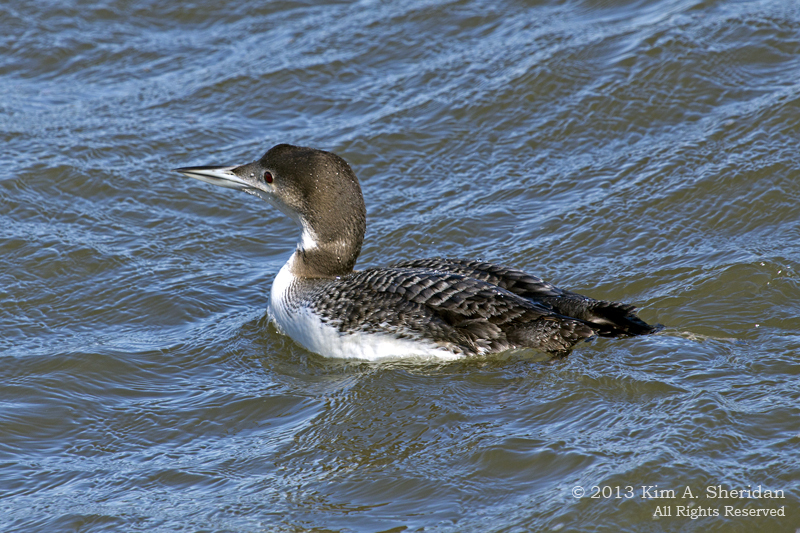 This is a Common Loon, transitioning into breeding plumage. 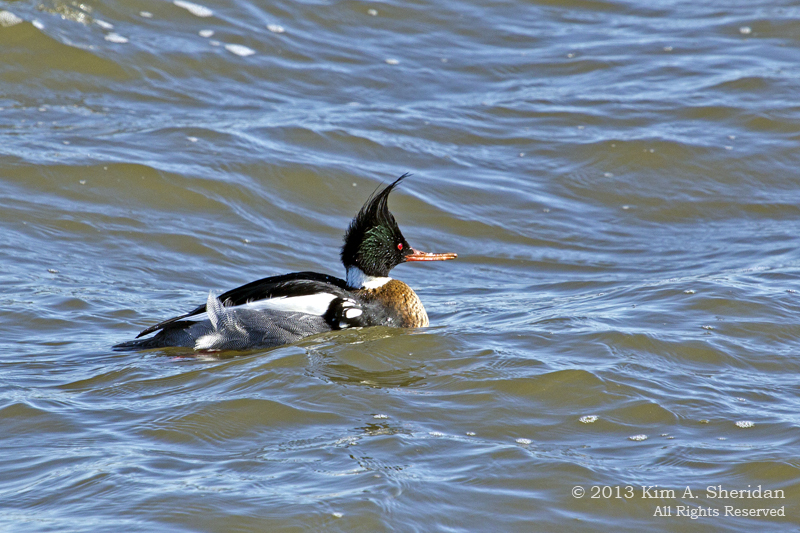 Female Red-breasted Merganser at Barnegat Light, above and below. 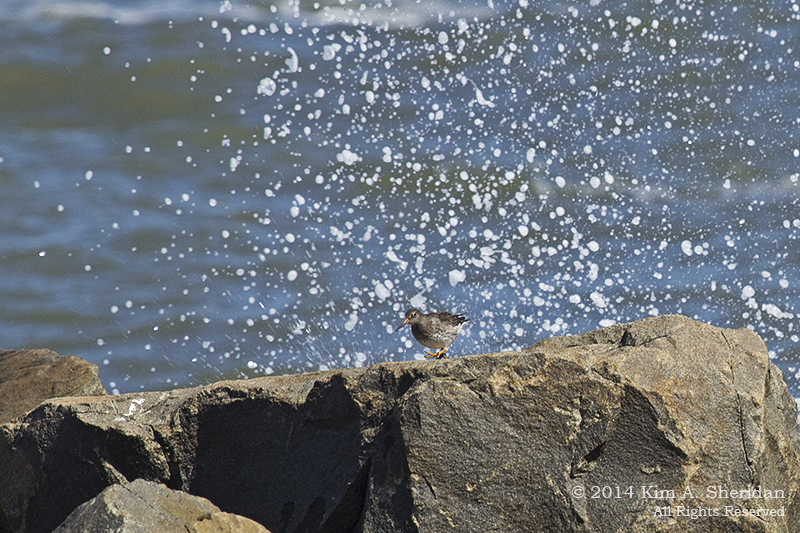 Purple Sandpiper on the rocks at Avalon. I don’t usually take photos of gulls, unless they’re flying or doing something really interesting. 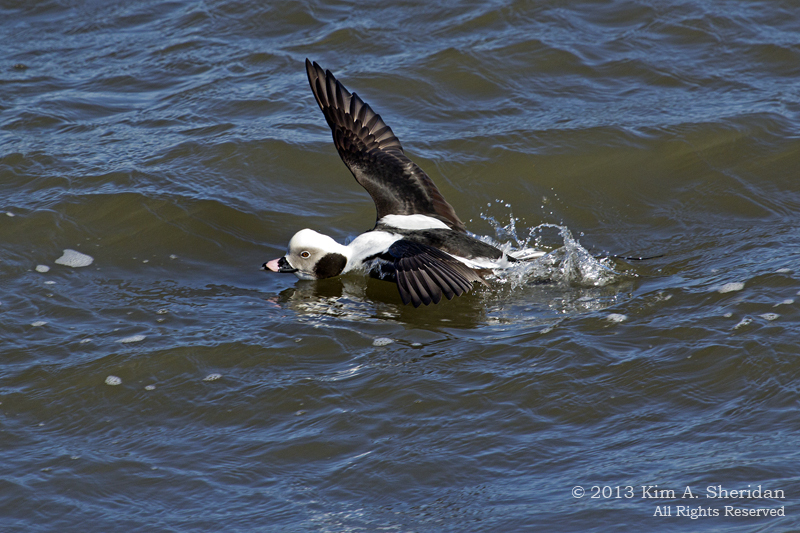 Gulls pose identification problems, and usually I’m seeing the same species over and over. This particular gull flew past in West Cape May, and I’m glad I took the shot. 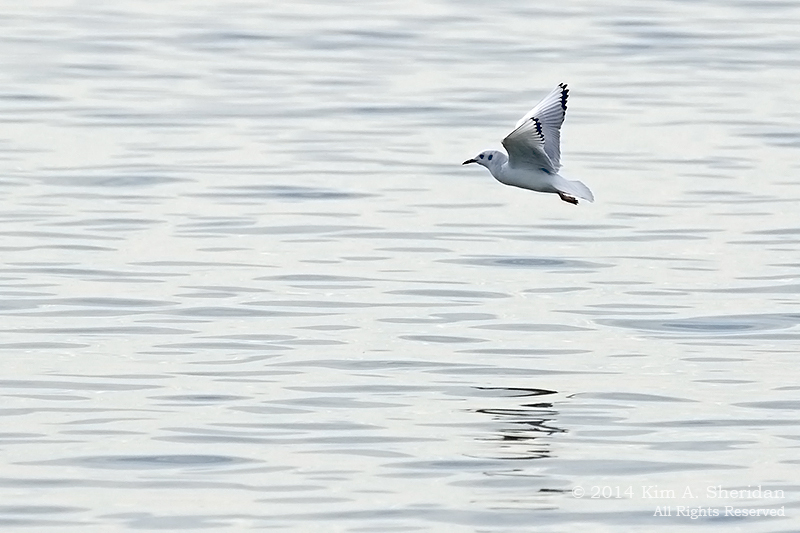 When I got home, I realized I had something different – Bonaparte’s Gull, a life bird for me. It was my second lifer that day. 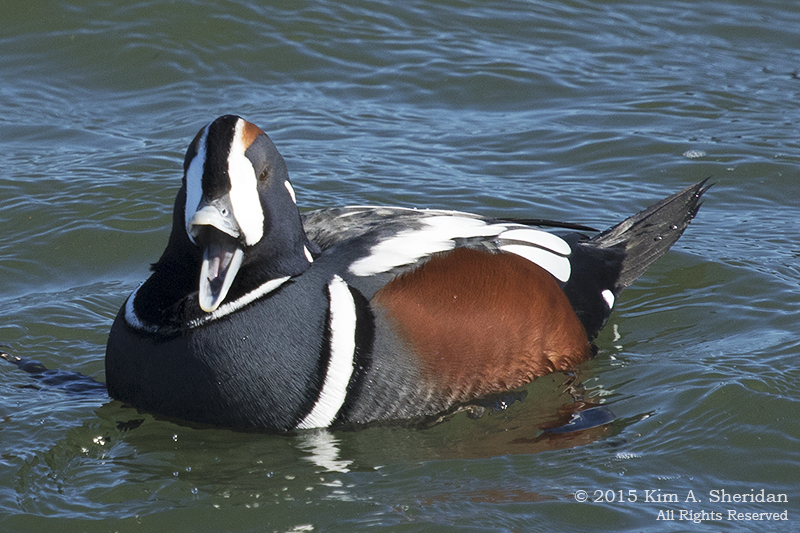 In popular birding places, you often run into other birders who are happy to share news of interesting birds. 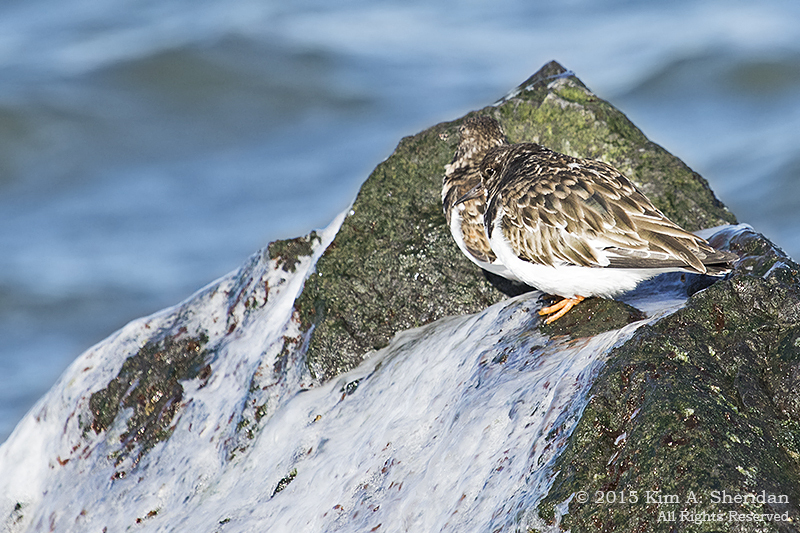 Two guys I met in Avalon suggested I go to Stone Harbor Point to look for the Smith’s Longspur that had been seen there. “Just look for a big group of people; that’s where it will be.” Sure enough, out in the grassy meadow between beach and bay was a group of people with binoculars and scopes, chasing a cryptically colored, sparrow-sized bird around. I never would have found it, much less identified it, by myself. Lifer #3 for the day. 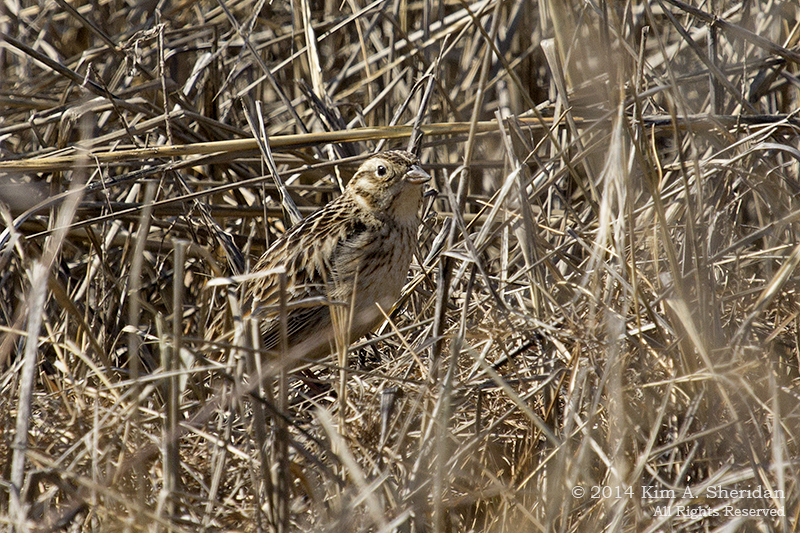 Smith’s Longspurs hang out in the middle of the country, and are quite rare in the East, which is why so many people wanted to see it. I’m sure this poor bird was wondering if he’d ever get a break from the crowds to eat in peace. I also heard from two different people of another unusual sighting, a Ross’s Goose in a field behind some homes in Cape May Point. Sure enough, there it was. 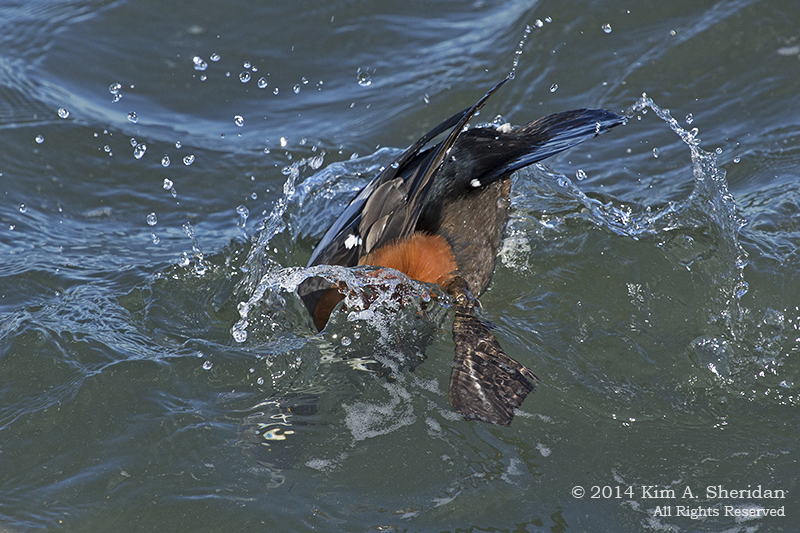 A great way to end a day of birding at the Shore. In the last week or two, the weather has warmed enough that the foot-thick snow pack has all but disappeared. My crocuses are blooming, the first rays of sunny gold heralding the inevitability of spring. The Bald Eagles at Heinz Refuge are incubating eggs. Geese have been migrating north for some time. 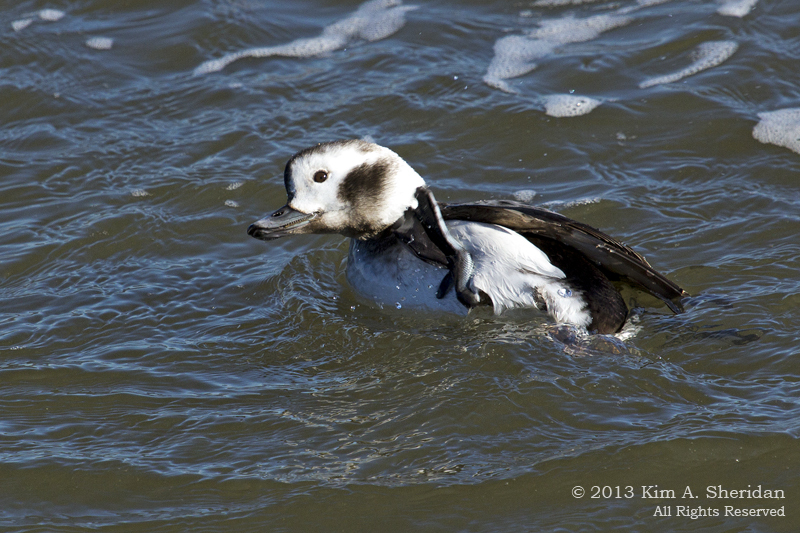 Soon these winter ducks will take off for their breeding grounds to bring new life into the world. Flowers and trees will bloom, and baby animals will be born. It won’t be long before spring is off to a flying start! Let’s take a little trip back to the images that inspired this blog in the first place. 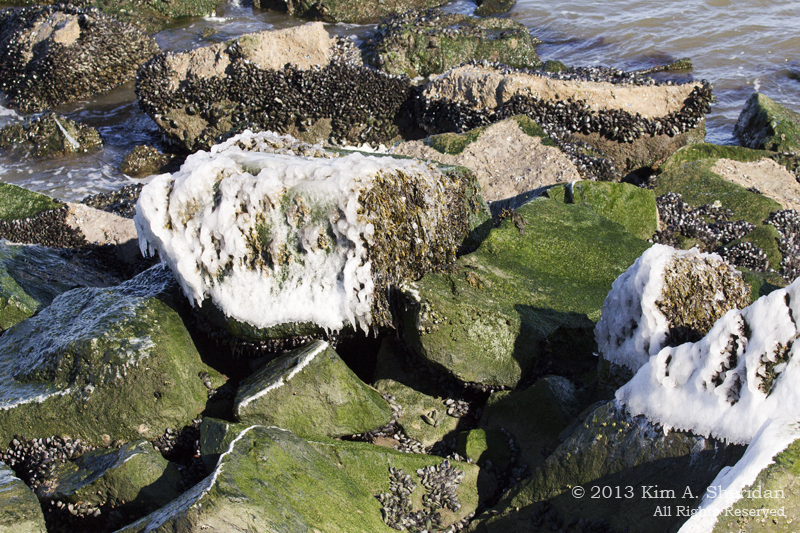 In February I went on my first trip with the Heinz Refuge Photo Group, to Barnegat Light on the Jersey Shore. 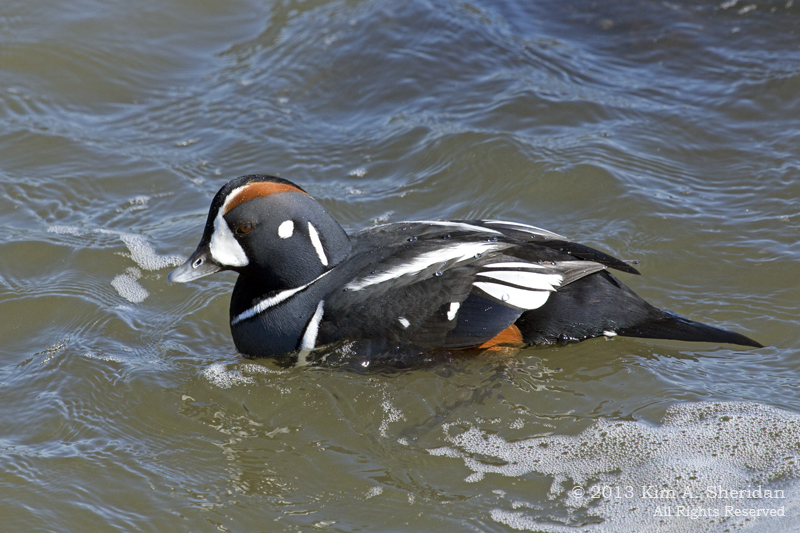 In the winter the Inlet attracts a variety of ducks and shorebirds you don’t get to see other times of the year. The challenge is getting to them! To get close you have to walk out on the stone jetty, which can be dangerous when it’s wet or icy. People have been known to fall between the rocks and get stuck. The day of our visit was sunny, cold and very windy. Fortunately the jetty was dry, and we walked the whole length of it. 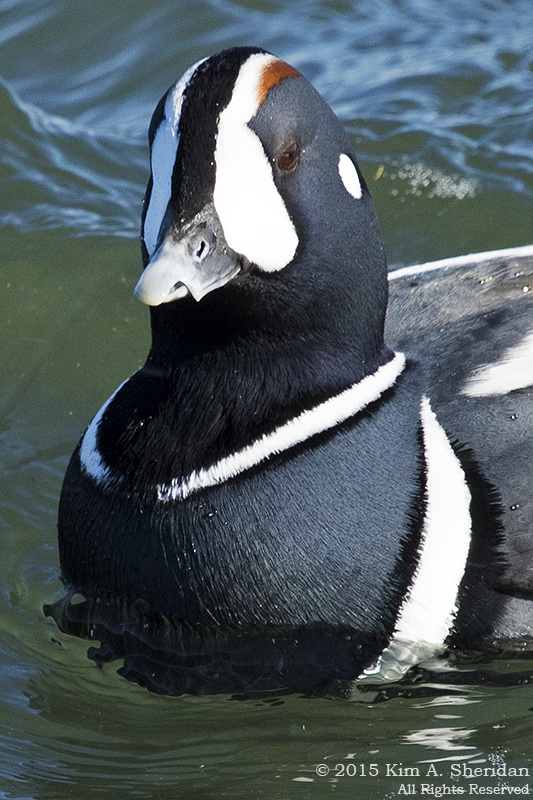 The ducks were very close in, I saw 6 new bird species, and it was a great photo day for me and my new zoom lens. All of these birds were new species for me. 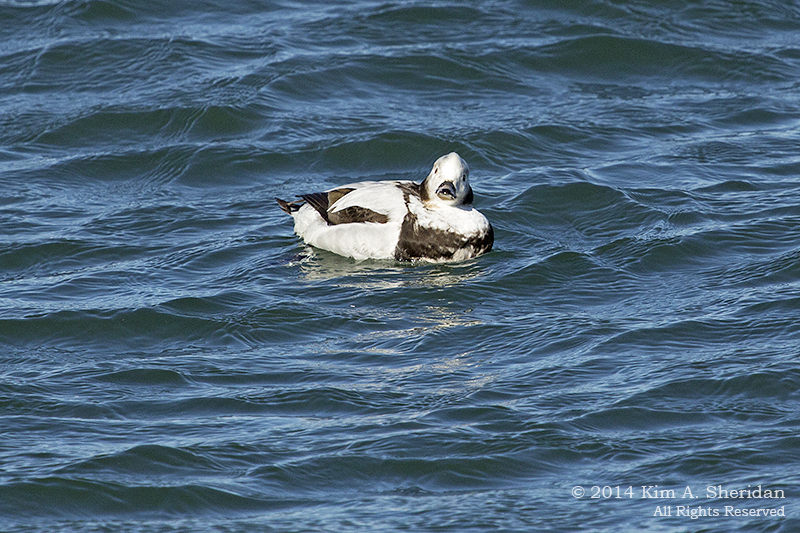 Long-tailed Duck with an itch, and demonstrating a perfect belly-flop. 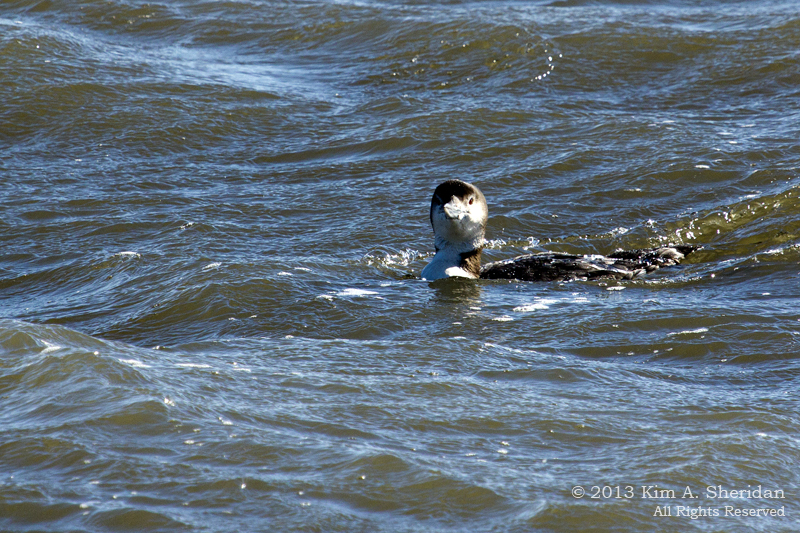 Common Loon – my first view of Loons. They were silent though. So I didn’t hear their signature eerie calls. 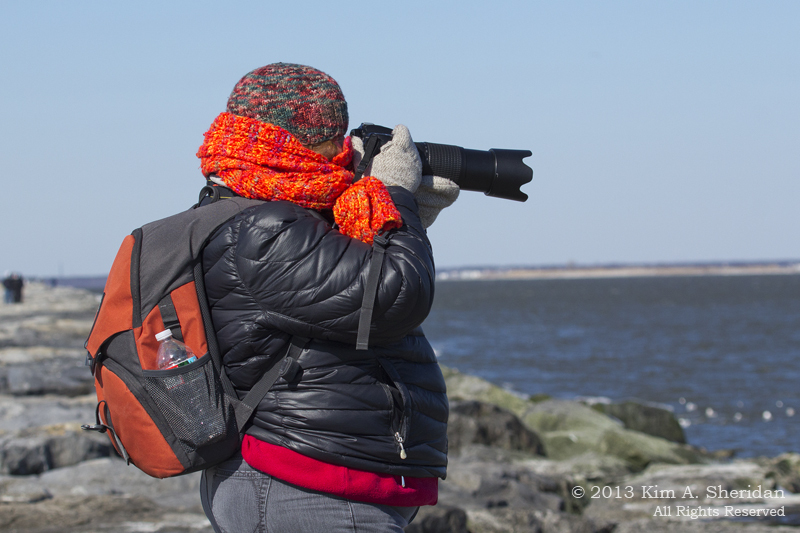 What the well-dressed photographer wears at Barnegat Inlet. Double mufflers! Colleen, trying to keep warm. 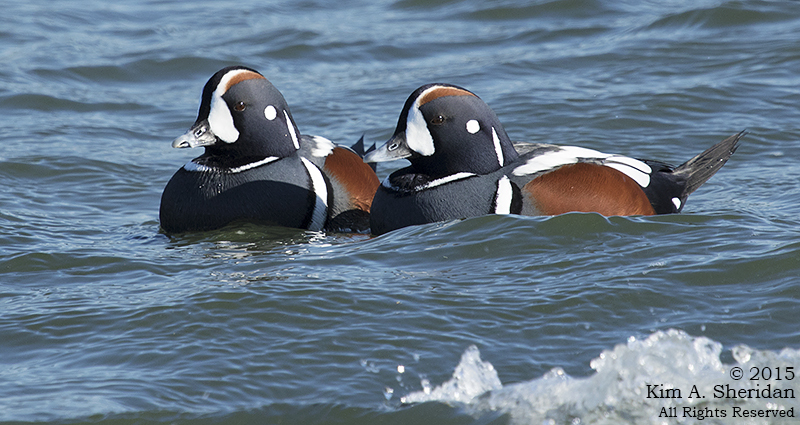 The stars of the Barnegat Show are the Harlequin Ducks. 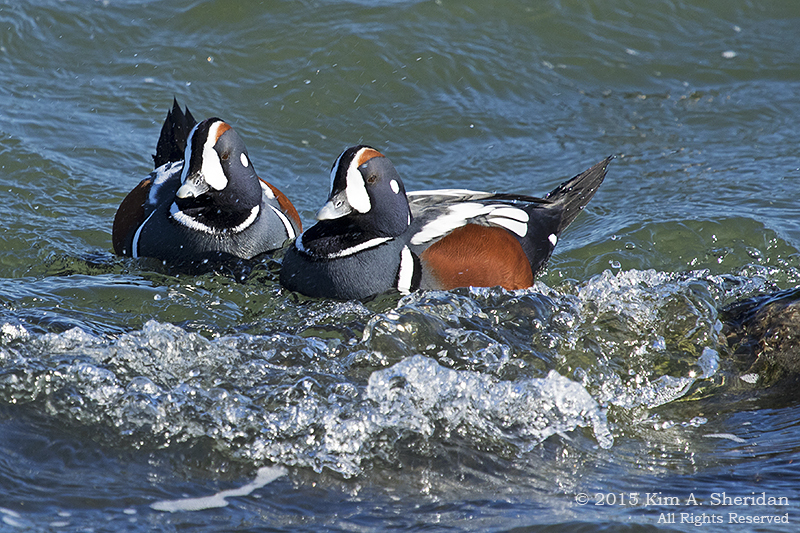 The colors of the males’ plumage are amazing. They were out at the end of the jetty, so we had to walk a long way to see them. Hopping from large boulder to large boulder was slow and tiring. The payoff was worth it, though! Harlequins like the surf rough, and had no difficulty standing up to the waves, even if it meant getting a face full of water. Cold water.